Many of the poor could not afford anything more elaborate than a crude stone or a metal cross to mark their family graves. 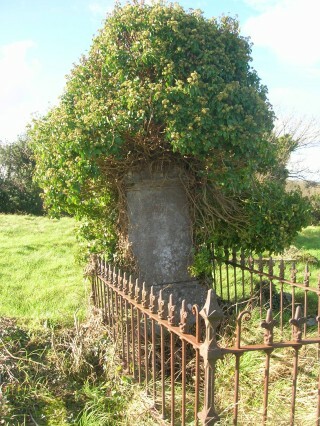 Those who could afford to erect gravestones did not always do so. Some of the old headstones in the cemetery have not weathered well and are impossible to read. Catherine Cronin has gone to great length to decipher the inscriptions. She was rewarded when the ivy was removed from an ancient headstone surrounded by an iron railing to the left of the main entrance. Pat Mc Donagh discovered through his research on John Walsh that he was a storekeeper/ railway contractor and investor in Queensland. He was born in 1842 in Co. Galway, Ireland, son of John and Margaret nee Geoghan. He arrived in Queensland in 1863. 1877 Storekeeper at Smithfield, Cairns. 1884 He went to New South Wales where he was listed as a Railway contractor and investor. 1876-1877 he was Mayor of Cooktown. He married Margaret Jane Clohesy (1842 1914) on the 28th December 1867. He features several times in the Official Records of Debates in the Legislative Assembly,Victoria. 1879 He was elected as an honorary commissioner with others to represent the colony of Queensland at the Sydney International Exhibition in September. He died on the 13th February 1893, Randwich, N.S.W. and is buried in Waverly cemetery R.C. There are many more headstones with a story to tell! There are several crude stones scattered around the old area of the cemetery. When it came to death some families would travel great distances to have loved ones returned to the family’s traditional burial ground. In the cemetery there are several people from the neighbouring parish of Killannin buried. When the Workhouse graveyard became over crowded inmates remains were brought to Kilcummin cemetery. The late Dudley Walsh remembered several bodies from the workhouse who were buried together in a mass grave to the right of the main entrance. The earliest grave recorded in the cemetery to date dates to 1747. The vast majority of the graves are of the late 18th century and on wards. The I.H.S. monogram – Jesus Hominium Salvator – Jesus Saviour of Mankind, is found very frequently from the earliest records down to the present day. From the end of the 19th century until the second quarter of the 20th century the Sacred Heart of Jesus is frequently invoked. The most common invocation on the oldest graves headstones is” O Lord have mercy on the Soul of” or “In loving memory” seems to be used in later times. There are some very interesting symbolic decorations on the headstones and slabs. Take a closer look the next time you visit the cemetery and if you have an interesting story to tell we would be only too delighted to record it. My grandparents Patrick O’Farrell [boot maker] and Eleanor O’Farrell of Camp street his wife passed away about 1923 it could be a year earlier or later. Both lived in Oughterad. I wonder if it’s possible their grave could be listed in Kilcummin cemetery. Unable to travel myself it would be great if I could obtain an answer. John Harris 05/10/2013 . Looking to see if there are any FURDON’s in the cemetary. According to Ireland Civil Registration Death Index John Furdon died about 1868 in OUghterard Ireland…. It is a charming town and I have found other family members there… Thank you for your great work. I am looking to know if John and or Mona Lee (Lydon) Halloran are buried in Kilcummin Cemetery and if so how I would find the graves. There is also talk of a child of there’s named Peter who died young but so far I only have stories. Hi, It is likely that Richard Conway was buried in the grounds of the Church of Ireland on Main Street, Oughterard and not in Kilcummin cemetery. The Standard Newspaper, September 13, 1852 gives details of the Church of Ireland Bishop in Tuam having visited various parts of Connemara, including Oughterard, where he blessed a new extension to the church there. He also blessed the site of a new school in Glann which was to be used for religious practice. This is close to Castlekirk. I too would like to know if there are records as to specific graves in Kilcummin Cemetery. I have a record, obtained from the Galway FHS West, re the church burial in 1857 of Richard Conway, aged 50, whose address was given as Castlekirk. His date of death was 26 May 1857 in the Parish/District of Kilcummin. His denomination was Church of Ireland & the burial was conducted by Rev John O’Callaghan. I believe that Richard is my gt gt grandfather. Thank you. I would be very interested in finding out if there was a list of those buried there. I am specifically looking for my gggrandfather, Stephen Gavin, b early 1800’s who was from Oughterard.